Humans love eye contact. It can make us feel appreciated, special, loved. However, as it usually is with our cats, things aren’t that simple. Eye contact, which we view as friendly, our furry companions view as assertive or threatening. But it makes sense if you think about a cat’s natural instinct. Cats can be very self-conscious. When it realizes it’s being watched, the cat may assess the threat, and then return to whatever he was doing, but in a more self-conscious way. The direct eye contact intimidates your cat, which can make him uncomfortable. Similarly, this is why cats try to out-stare each other to resolve conflicts. It’s a battle of the wills. That’s also why if two cats are fighting, it can help if you break their line of eye sight with a blanket or tray (never your body!). By cutting off their line of sight, they may become distracted and go on their way. This may provide a glimmer of insight to why your cat may tend to approach non-cat people in a room. Just imagine it – you have a number of friends over, and your cat walks into the room. That said, not all eye contact is bad. Some folks try “blink kissing” with their cats – blinking slowly and deliberately while staring directly at the cat. This break in eye contact is supposed to convey “I’m not threatening; you can trust me.” Some cats may even blink kiss back, others may become more self-aware by fluffing up or grooming. Some claim that blink kissing can build a stronger bond between you and your cat, but I say you may want to take this with a grain of salt. One concern I hear now and again is that an owner’s cat doesn’t blink kiss back. I guarantee it’s not because your cat doesn’t love you, it’s most likely because he’d wish you’d cut back on the intimidating direct eye contact. In fact, cats usually reserve their direct eye contact to things that they’re focusing on, such as a toy or dinner. Most of the time, a cat is paying attention to his surroundings via his incredible peripheral vision. 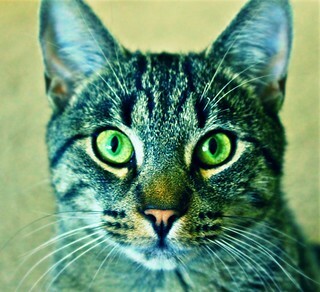 While a cat’s eyes can communicate how he’s feeling, generally they convey just one part of the overall message. 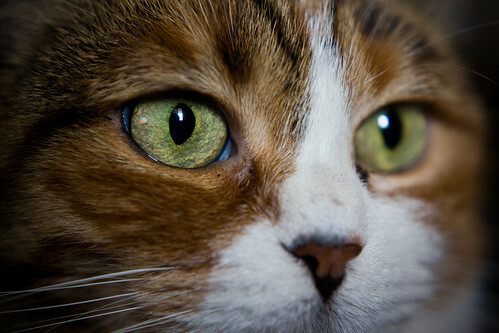 When reading a cat’s eyes, be sure to keep several factors in mind. For example, a cat’s pupils may dilate or constrict based on how he’s feeling, or they may simply be adjusting to the light. What’s funny about a cat’s eyes, especially his pupils, is that the feelings that they convey aren’t black or white. Consequently, it’s important to keep in mind your cat’s body language as a whole to see how he’s feeling. The blink kiss portion was very interesting. My cat (from growing up) and I used to do this to each other. I never knew it signaled anything specific to her, but whenever we made eye contact, one of us would do a slow blink and the other would copy it back. I thought it was our way to say I love you! I had her for 19 years, she was such a precious cat, and it took many years to ever desire to have another pet. It was really neat to learn it meant something to her, and how much trust she had in me! ill have to try the blink kiss. i see my cat doing this all the time around me but i just thought he was tired. My cat will often come sit on my desk when I’m working, either on my laptop or in books, and will contently sit next to what I’m working on. Even when I’m not touching him: he’ll stare at my arm en then bite down hard on my arm or shoulder. I do nothing to provoke this. My cat is not an agressive cat, he’s even very calm and submissive. But today, he bit down hard on my cheek almost until he drew blood. I don’t understand this behaviour at all. I know and understand cats but this I do not understand.